Experience hours may be any combination of classroom, lab, and shop or plant time such as internships and/or co-op work-study programs for the Green and Blue credentials; all other credentials only count paid work hours. Hours are cumulative lifetime hours, not related to any calendar or school year. School hours must be from a WCA accredited school. 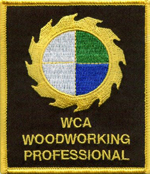 WCA maintains a record, as represented by the Passport, of each Woodworker’s points and provides verification to educators or employers as requested by the Woodworker. 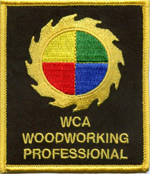 Students in a WCA accredited school have the option earn the Sawblade Certificate before the Green Credential if they don’t acquire enough hours in school for a Green Credential, which is typical for a high school program. Note: Every Passport holder/candidate must pass the BASIC Layout and Measurement Skill evaluations before earning any additional Skill Points. An experienced Woodworker with the requisite experience hours can test DIRECTLY to any Credential without progressing through the series (Green, Blue, Red, Gold, Diamond). Contact the WCA office to create a custom career path. Your achievements are recorded in the WCA Registry. 30 Skill Points and 800 experience hours in school or industry. The 10 Skill Points recorded for achieving the Sawblade Certificate (if earned) will be applied, meaning only 20 more Skill Points need be earned for Green. 60 total Skill Points and 1600 total experience hours which can be earned in school or industry. 120 total Skill Points, 3200 total experience hours (lifetime) + Red Project. The 1600 additional experience hours above the Blue credential must be paid work hours only. The Red Project is defined as a demonstration of skill which may or not be related to his/her current employment. The Evaluation Committee (consisting of a local evaluator and his/her employer) reviews and approves the proposed demonstration plans and specs, stating the criteria on which the work will be judged. 180 total Skill Points, 4800 total experience hours (lifetime) + Gold Project. The 1600 additional experience hours above the Red credential must be paid work hours only. The Gold Project is defined as a demonstration of skill which may or not be related to his/her current employment. The Evaluation Committee (consisting of a Woodwork Career Skill Evaluator, a Woodwork Career Chief Evaluator, and the candidate’s employer) reviews and approves the proposed demonstration plans and specs, stating the criteria on which the work will be judged. Total time to complete the demonstration may be part of the criteria. 240 total Skill Points, 6400 total experience hours (lifetime) + Master Project. The 1600 additional experience hours above the Gold credential must be paid work hours only. 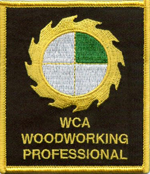 The Board of Directors seeks input on the development of the process and system for experienced woodworker to apply and qualify for the Red, Gold, or Diamond Credential based on their work history. Please use the CONTACT form when you are interested in helping or making a suggestion.